Before I tell you what I saw in the mall (you can guess) I want to share this memory of the ladies clothes that were so popular not too long ago. 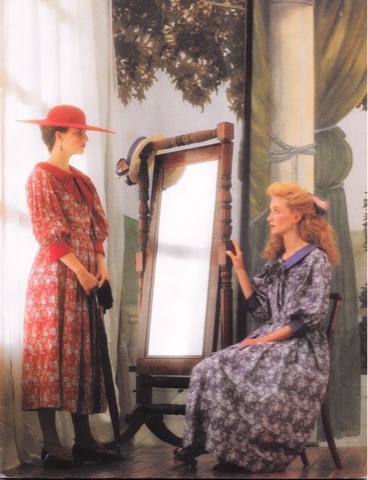 These are Laura Ashley clothes, but in the same era were similar designers going with this loose, feminine, comfortable style. Just wearing it made you feel adequately covered (but not frumpy or sloppy), confident and happy. The colors and prints were so harmonious with God's creation, whether or not it was intended. There was something very wholesome, sweet and yet serious about these clothes. They depicted dignity. Do you ever wonder who dictates styles to us and who decided the women in this decade would not be able to find pretty clothing that also felt good to wear--clothing that was no nonsense but feminine? Women still wear these clothes, because 25 years after the style was replaced, they are still in good condition. There should be sewing patterns for the dresses in both the pictures here. I wonder who decided there would be no more Victorian clothes available for women who preferred them, and why there are not more choices of clothing of different eras. Some ladies do not like the unlovely, unflattering clothes that are presented in stores year after year. These clothes were made of high quality cotton and not of the synthetics we find in stores today. The garments did not cling and you didn't always have to be tugging at shoulders and waist. 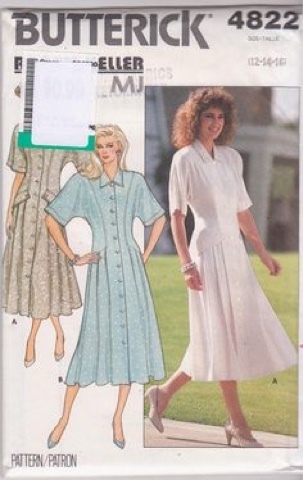 This was the first Laura Ashley pattern I ever owned. One thing that made these clothes so well liked was they suited women multi-generationally. Mothers, daughters and granddaughters all wore them and there was no special youth style section in the stores. The sizes were varied but the styles suited everyone and were liked by women all over the world. Blouse: Goodwill, not worn, $5.00. It would have cost me quite a bit more back in the 1990's. Cardigan: Walmart, $5.00. 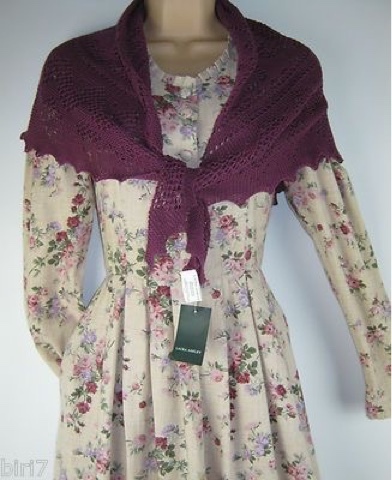 The Laura Ashley cardigan was originally 6 or 7 times the price or more. Skirt: given to me from an estate sale. It is not a Laura Ashley brand but a very similar design, with tucks along the hem. One reason I did not own many Laura Ashley things was their price. 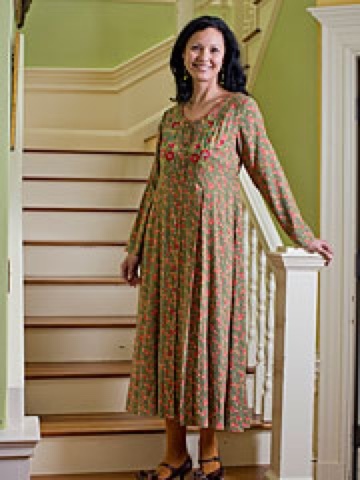 Dresses were often $80.00 to a hundred dollars, so it made more sense to buy a pattern for home sewing. However now these clothes are surfacing in the thrift shops at cheaper prices. It's just a pity they are not "in style," because now they are affordable. I am happy to see many young women developing their own style and leaving the current fashions behind. No one should allow the current trends to dictate the way they dress. We have not been to a mall in years, but decided to walk through one this week. The place was almost a ghost town, with many shops empty. Is all this supposed to be pretty? My husband asked how anyone could think this is pretty on a woman. There were certainly no admiring gazes from passers-by. Young women were not giving any of it a longing look. They are tired and bored of it all. It has been the same old torn clothing for several decades has it not? Yet someone keeps pushing this style. The ugly clothes have been prominent for so long that ladies feel silly and out of sorts when wearing anything pretty. Maybe one of the reasons so many shops in the mall have moved out is due to lack of selling those boring, drab things that women have had to wear and look at for so many years. More Laura Ashley from Etsy and EBay. The style was loved equally by girls and grandmothers. 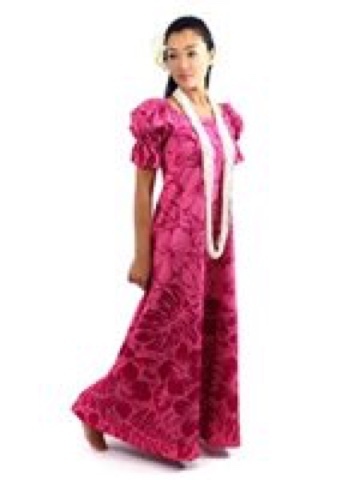 I often saw families in church sitting together with the women wearing these cheerful dresses. No one made fun of them like they do today: they were high fashion and very expensive. A pattern I am going to order online: many of these dresses were made of fine wale cordoroy or polished cotton or cotton velveteen. Patterns I am going to order. 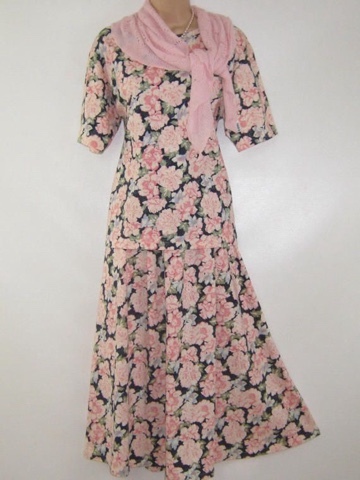 All of the older dresses you have just posted are beautiful and I would wear them today. I noticed all of the April Cornell clothes are aprox. $70+ a piece also, but they too are so pretty. 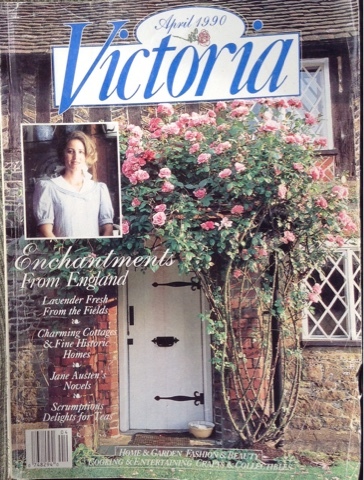 I loved Rachel Ashwell, April Cornell and Laura Ashley clothes. They were and still are so feminine and made you feel special. 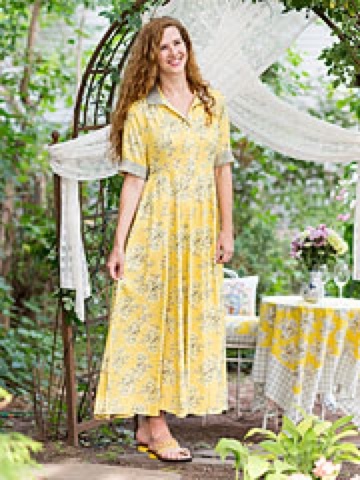 After studying a catalog of feminine styled clothes, I can go to most pattern catalogs and find similar patterns to make the outfits for much less. The outfit that you put together is lovely and feminine. This is excellent! I love it! You are so right! I love the Laura Ashley clothes. It is sad that we are almost slaves to whoever is the designers and inventory buyers for the stores. I hope there is a comeback for sewing our own clothes. Blair is a good place to shop and very reasonably priced on most things. They also have a "family"of other shops on their website, so they have a very good selection. I could Not agree more!! I have been trying to wear many of these style clothes I found at Goodwill and some were given to me. They are PRETTY. Why did pretty become a bad thing?! Someone (nicely;) referred to my clothing as "dated". This will not stop me and I pray we can shift this around to women feeling comfortable looking like ladies. I really enjoyed this as this is a topic I often find myself thinking and talking to my family about. I only wish I had the confidence to sew some of these! I too see the pretty patterns on ebay, etc and would love to sew some!! Oh, how I wish I could find dresses like you have shown in the mall! It's very challenging! My little girl is turning 11 and we have a very hard time finding things that are appropriate and lovely in her size. Maybe someday these fashion designers will catch on and make ladylike clothing once again! Just yesterday I was working on my scrapbook of pretty things...the magazine pages I have saved, and just about anything I found that was joyful. 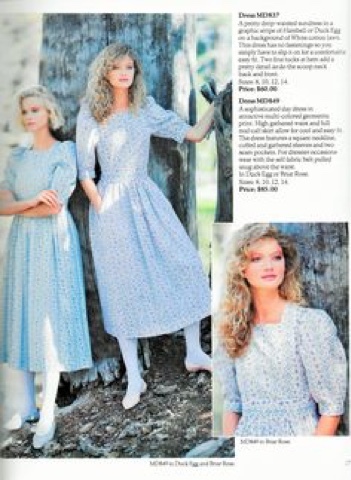 I had pictures of Jessica McClintock dresses from the 1980's the drop waist dresses. Oh I miss those days so much. 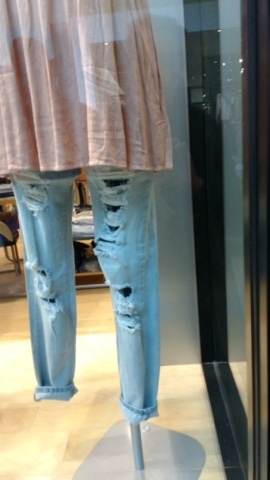 Why would any girl or woman want to wear torn up jeans? Like she had just gotten out of working in the ditches? This new style of "fashion" is lost on me. The more beautiful fabric in a dress, the more beautiful the whole impression in my mind. Kelly T.
You have touched on a nerve that I have felt for years. One has to really look to find soft looking feminine clothes now days and mostly by magazine. I would tend to agree most items in the window are ugly. But if you look closely most people's attitude are connected much the same way. What you wear changes your outlook and attitude. Years back when I was a girl in school I remember having a conversation with one of the cosmetology girls from my classroom. One of them had gone home to put on a dress before going to her next class. I asked her why. She told me," Our teacher insists we wear dresses. Don't think about showing up without being in one. She says we act more lady-like." I was dumbfounded but as I think about it today it makes sense as it affects our attitude, and more people watch us because of it. If dressed in this manner you are saying to the world I am modest, clear thinking, and I respect myself. You stand out than most gals. You are in your feminine sphere, and soft colors along with accessories WILL get you noticed and sometimes a comment as I am sure Lydia can attest. 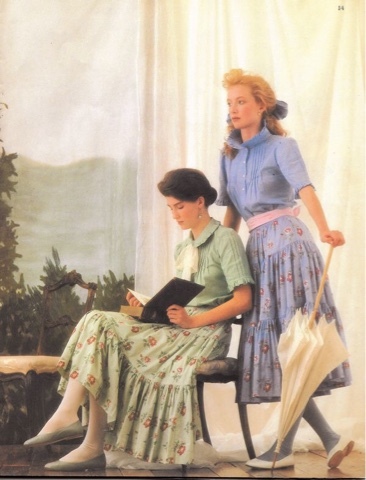 Those Laura Ashley clothes are so beautiful. I remember getting their catalog and just adoring every page. I couldn't afford them either. I never got over that Laura Ashley-Gunne Sax look and still wear long floral skirts and bits of lace. A lady the other day commented that I always look so Edwardian. Was hoping that with the popularity of Downton Abbey that these styles would make a comeback. Truth be told, I'd rather see young woman in those ripped jeans then those skin tight leggings and yoga pants that are popular. At least they leave a little something to the imagination. Ha! Such beautiful clothing and so hard to find. Those jeans are ridiculous. And the consumer is expected to pay extra for the "distressed" look. I'm distressed just looking at it! Amen!We need to bring back these lovely dresses. I love this style. I plan to sew a few dresses soon.I am short and a little rounder than I would like to be,but some of these styles are very forgiving. They flow over the roundness 😊You are so creative to put these outfits together. I am learning. Thank you for taking the time to encourage others to dress more feminine. Love your teacup posts.What a collection. God bless,Sharon Do you have an address, I would love to drop you a line. Love all these pretty dresses and especially the outfit you put together. I was once told that I look like a librarian because of the way I dress and wear my hair (a nice complement in my mind though I don't think it was intended that way!). Part of the problem I have with sewing is not only finding the nice patterns but also the fabrics. So many of them seem garish and trying for attention. 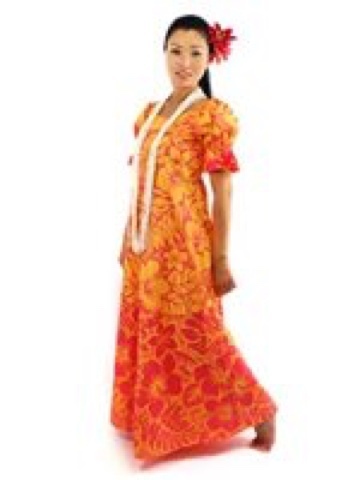 Maybe if many people went back to beautiful dresses and skirts we could start a new trend. Kind regards to all. You are so right. I wish the ripped-up jeans look would go away. Some preachers even wear them in the pulpit (to be cool). This style has been "in" for way too long. Time to return to pretty and feminine. I love the hairstyles too! In the older photos! Those ripped outfits look like rags, especially next to the gorgeous dresses. 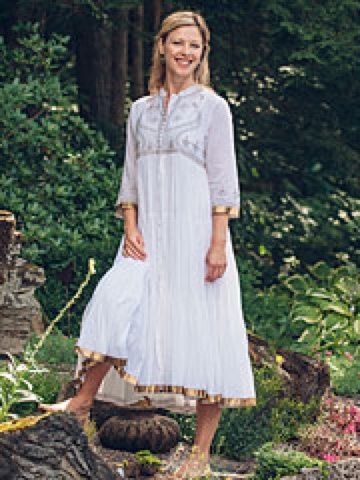 The beautiful dresses are also much more versatile and functional, thanks to the modesty they impart. Buying grandmother's floor washing rags and dust cloths as clothes looks like brainwashing to me! Thank you for this smart post. 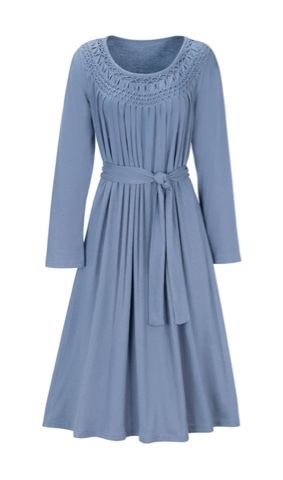 Laura Ashley dresses and the other modest dresses are lovely. 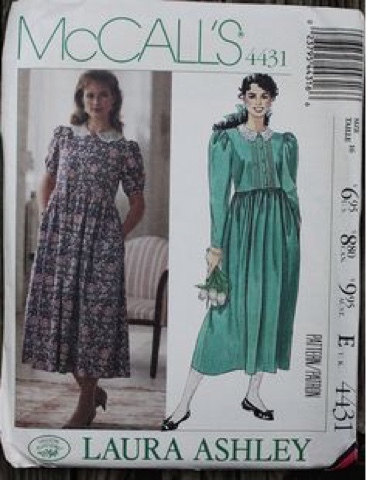 Unfortunately Laura Ashley dresses were always far too expensive. I did find one in a charity shop some years ago and I wore it for a number of years. It was exquisitely feminine. 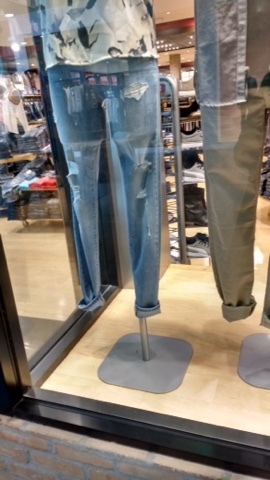 The torn jeans are hideous and are a symptom of a hedonistic decadent society. Shame on any Christian who wears such hideous garbage. Tattoos and nose rings and lip rings I likewise condemn. These dresses are so beautiful and feminine! I love wearing beautiful skirts and dresses, and finding any of these items in a mall or big box store is virtually impossible. I shop in thrift stores for this very reason. I am an elementary school teacher and I overheard the cutest, most innocent conversation yesterday among three of my students. They were discussing which of my outfits they liked the most, and actually took a vote on their favorite! (The winner was a handmade skirt of cheery yellow with bright red cherries on it!) I have noticed over the years that the little girls in my class take notice whenever I wear a flower in my hair because they start wearing one to school or they start wearing cute cardigans over their little uniform shirts. Little girls still long to be pretty and feminine, but unfortunately, our society has put too much emphasis on women's sexuality and power and softness and femininity is being lost with each generation. I especially like dressing a bit more for church. This is a comment for Southern Ladye - I love that the little girls notice how you dress. Great example for them! It's a comfort to see all these comments, to know there are like minded ladies out there somewhere! I have four daughters between 7 and 17, and the older a girl gets, the harder it is to find girly clothes for them. We have had some success at thrift stores, thankfully. I am swooning over all the beautiful dresses! 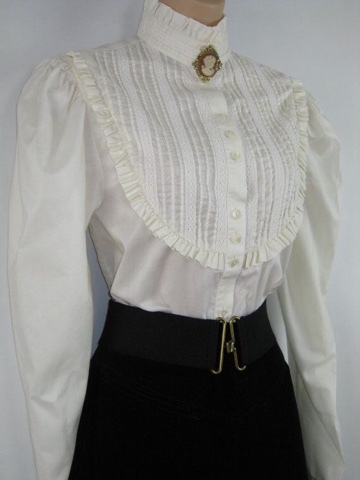 I always loved the Laura Ashley, Gunne Sax, etc. lines but they were too expensive for me. I especially like the outfits in the picture with a lady dressed in green sitting down and a lady in blue standing. They look like blouses and skirts but could be dresses. Anyway, they look like perfect everyday wear as the blouses aren't too fancy or fluffy. Lady Lydia, I love the outfit you replicated. It's so pretty. I also give a thumb's up to Blair. Oh, I know it's the right season for this, but The Vermont Country Store usually has pinwale corduroy dresses in solids and florals and flannel plaid dresses for cold weather wear. 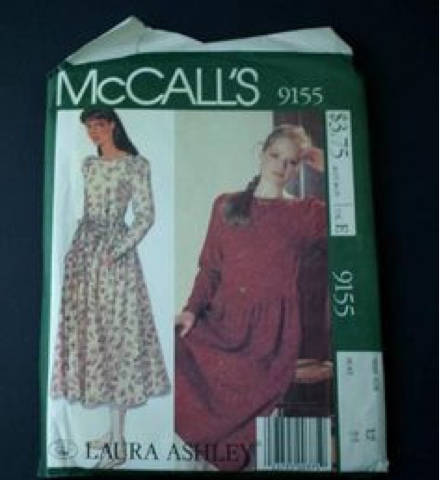 On eBay, Etsy and thrift stores, the Laura Ashley dresses are the same prices as when they were new in the 1980's. The patterns are also similar in price as back then. I would like to see these being made again and I do hope people will be able to see the original garments at least to touch the fabric for quality. They were made of a nice sturdy closely woven cotton that was not too thin. To make them in the thin cottons from the the fabric stores does not get the same results, and they do not look good in any synthetics. Well, as I can see in the comments we have many that agree with this post! Truly who has been running the assembly lines of clothes that looks like trash worthy? The styles our cheap and do not wear well and wash up very lousy. Where are all the fashion designers that want a lady to look smart and sophisticated? Now it is apparent we now have lost all sense and sensibility when it comes to fashion! I wish I had kept all my older clothing from those years of soft and feminine. I guess I never could of seen this tasteless style being popular. May God bless those ladies that want to dress, lovely and to be able to find sweet deals either from Goodwill or can afford something from these mail order catalogues. 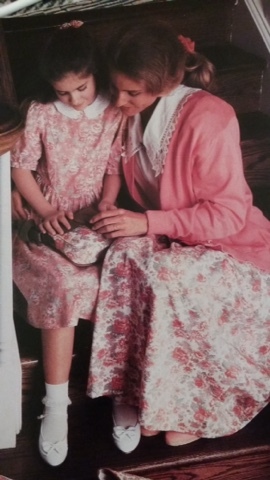 My daughter used to wear the Laura Ashley style dresses. (We couldn't afford the authentic brand). I remember one dress in particular that a seamstress made for her to wear to a special band banquet. The dress was a blue floral print cotton with dropped waist and gathered skirt. 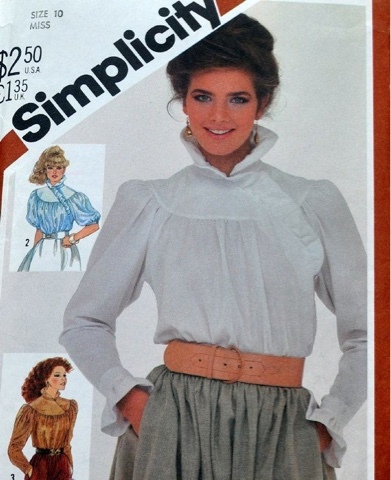 It had 3/4 length puffy sleeves. She looked lovely in it, and the dress was perfect for a teen. 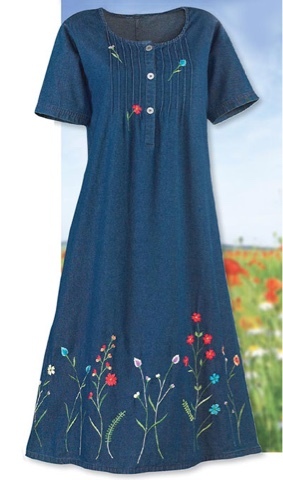 I don't wear dresses anymore, but I do like some of the April Cornell tops and tunics. Another online website that sells pretty, feminine clothing is Soft Surroundings. I think their things are beautiful. The price points on certain items are about the same as April Cornell designs. Such beautiful dresses! Makes me "oooh" and "aaah"! This post makes me feel justified in buying *15 yards* of beautiful cotton fabric yesterday (floral "Buttercream" prints at Joanns). In my defense, I got 50% off everything and had a store credit, so it wasn't as bad as it sounds! I also bought many packages of bias binding at the thrift store for about .12/package. I plan to make a couple of dresses for myself, maybe a skirt, and a few little garments for my daughter. My children notice when I'm wearing pretty things and they appreciate it! I believe it was Edith Schaeffer who once wrote that we can't underestimate the impact our clothing choices make on the people around us. So true! I loved these clothes. It's brought back good memories of the days when I and my two daughters wore similar dresses. 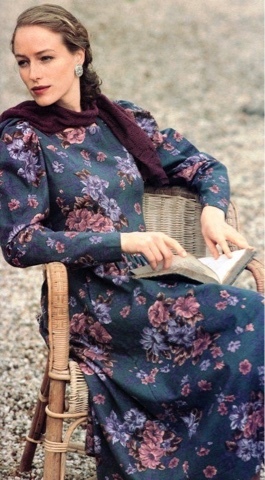 I'm reminded of Tasha Tudor who wore what she liked - long dresses and skirts and sensible shoes, too. I enjoy wearing long, flowing skirts feminine blouses,scarves and wide-brimmed hats. That's my style, even though it's not in fashion.The good thing is, we live in the day of "anything goes" and "do your own thing", so we can wear what we like and enjoy it. I laughed when I saw the torn jeans. A few years ago when these became fashionable, I was working in ladies wear at a major department store. A young lady looked through the jeans, then asked, "Don't you have any of the ripped jeans?" I laughed and replied, "No, but buy them and I'll be glad to rip them for ya!" It's sad to me that anyone would want to wear something so un-pretty. Thanks for your post. I enjoyed reading it and seeing the photos. My walmart has a new line of purses and backpacks under the Laura Ashley name with the floral patterns of the 90's. 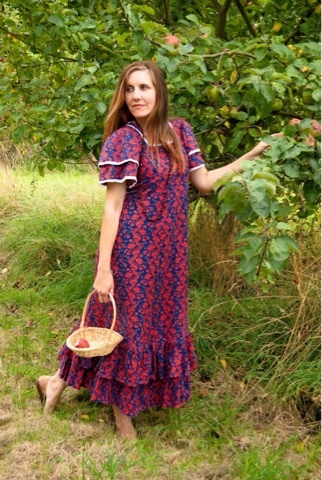 I was in my 20's during the laura Ashley/gunne sax era...and I loved all of the pretty dresses. I remember how amazing if felt, after a long summer of basic training (Army...don't gasp) to finally be able to wear a skirt and a bow in my hair (remember the giant bow worn at the nape of the neck over a low, loose ponytail? All those dropwaist dresses made me feel very pretty. I would not want to go back to that particular style but share your lament in the lack of pretty and feminine dresses and blouses. I recently took my daughter prom dress shopping and, though I think we did well considering the current styles, there was not one dress that made my jaw drop.... everything was so tacky and blingy. I honestly think if someone would start a store in the mall with dresses like this that are affordable, they would be soo busy. Women and girls would probably weep in their store because it would bring out the soft feminine side in them and would release chains in their hearts they did not even know were in there- the ones clothing designers have put in there. I sew for my daughters and I , and we wear dresses alot like this. I cannot tell you the many comments we have gotten in public, especially from men thanking me for dressing myself and our girls in modest but beautiful dresses. Dorcas you re right! There would have to be a tea room next to the shop to accommodate all the customers waiting to browse the store. There needs to be display wi does in airports and on busy main streets promoting such dress shops located in other areas with adequate parking.